PICT's The Shaughraun revives an old-school melodrama. 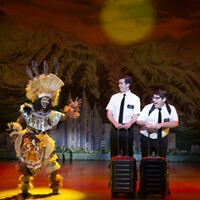 If you judge theater history by what actually winds up on stage, you could be forgiven for thinking that plays were made during one of only four periods: Greek antiquity, the reign of Queen Elizabeth, the Restoration and the 20th century. There's a lot from theater's past that never gets produced anymore. Everybody may go on about how Chekhov and O'Neill, for example, revolutionized theater ... but we never see what they revolutionized it from. 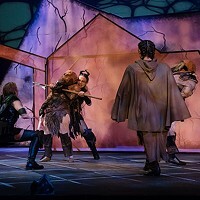 So here comes Pittsburgh & Irish Classical Theatre with its production of The Shaughraun. The play, written in 1874 by Dion Boucicault, is a prime example of the theatrical bread and butter of that time: The Melodrama. If you're familiar with early silent films, you're probably familiar with the style and substance of melodrama: A beautiful young woman is menaced by a mustached villain and can be saved only by a dashing, achingly noble hero. There's not a lot of subtlety, but then the audience wasn't looking for subtext; they wanted action, romance, easily recognized evil-doers and, especially, good triumphant. (Between you, me and the lamppost, I have a sinking feeling that's still all audiences want. And it's also the last thing contemporary theater artists want to deliver -- which may be why nobody goes to the theater anymore.) All you have to do is watch one melodrama to understand how shocking Ibsen and Chekhov must have seemed at the time. With Shaughraun it could be said that Boucicault has written the über-melodrama. Set in an Irish village, it's got two pretty women saved by two handsome heroes from two nasty villains. The heroines are cousins turned out of the family estate by a duplicitous overseer and his nefarious henchman. A British officer falls for one of the lasses, who is the sister of a falsely convicted villager who escaped from an Australian penal colony to see the other lass to whom he is engaged, etc. etc. etc. The most fascinating aspect of this style of theater is its utter lack of irony; the only time anybody's conflicted is when honor gets in the way of love. To be truthful, a little of this can go a very long way. Boucicault was painting solely with bright primary colors, and somewhere in hour three you do find yourself missing more varied shades. On a conceptual level there's nothing wrong with simplicity, but in practice Shaughraun's naiveté can be relentless. Though I'm not a big fan of meddling with a playwright's words, this is a show that could have used some serious editing. Seeing as how melodrama as an artistic form has died out, it's not surprising that most actors, especially constantly working ones, don't have much experience acting the style. So it's important you understand that the following is not a criticism: Nobody in this cast is doing less than professional work; it's just that most of them don't seem to be in the same play. 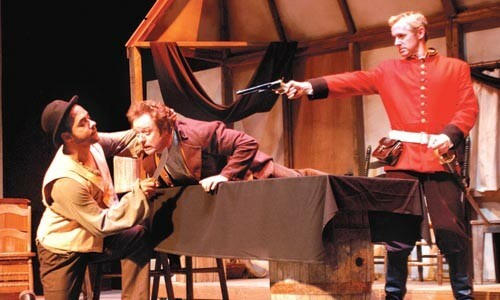 David Whalen, as the British officer, seems most successful playing the style and the period; his performance is camp-free, the sort of declamatory acting you would have seen in the original production. Diana Donnelly, Lisa Anne Goldsmith, Martin Giles, Jason McCune, Darren Eliker and Simon Bradbury -- though every bit as talented -- have allowed, in wildly varying degrees, a great deal of modernity to creep into their performances. Ultimately, I suppose, it's a case of doing what you have to to make it work. And considering how a lesser actor (me, for instance) would have shamelessly hammed it up, I do admire their restraint.